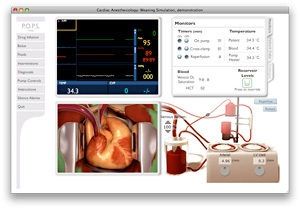 This simulation will cover process of weaning of a patient from cardio-pulmonary bypass. The challenges to successful weaning will be depressed myocardial contractility, hypo or hypertension, hypo or hypervolemia, hypo or hyperthermia, and arrhythmias such as myocardial fibrillation and heart block. This simulation will occur in real time. Your task will be to rewarm the patient and normalize the blood gases and electrolytes before reperfusing the heart. After reperfusion for the appropriate time, you will then gradually reduce the venous drainage and the pump flow until the patient’s heart rate, arterial blood pressure, central venous pressure, cardiac index and temperature are within acceptable clinical levels and maintain the patient's stability after the pump has been turned off for 5 minutes.